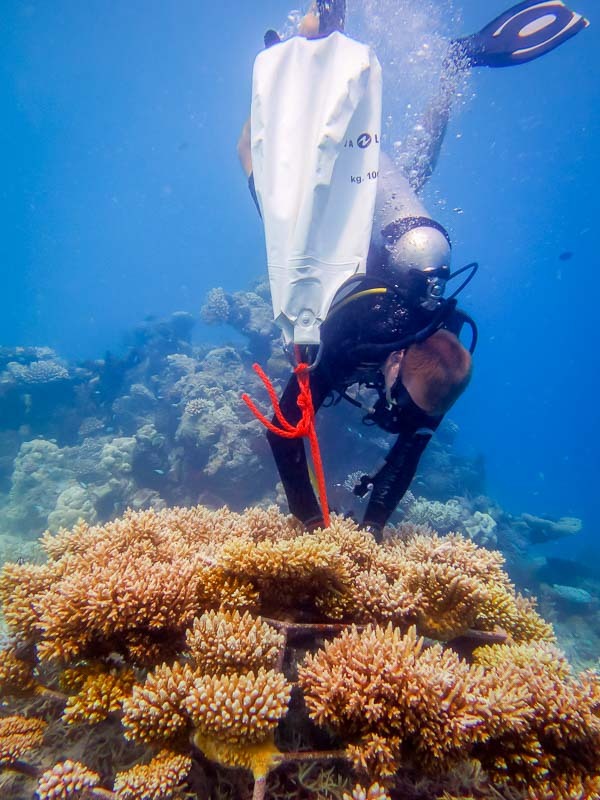 A total of 25 coral frames were transplanted during the month of March, and we have been monitoring and re-transplanting at the House Reef and Channel sites. 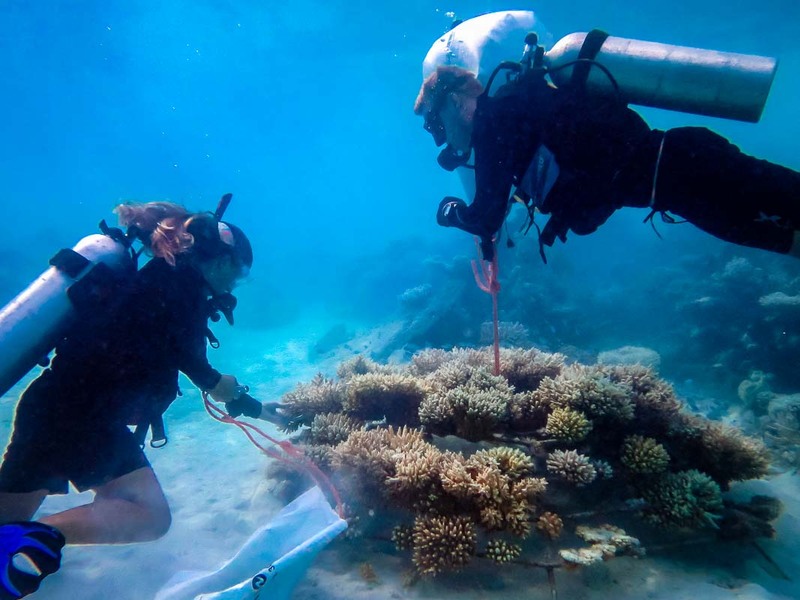 A total of 733 fragments were used, collected from donor colonies at the Starfish site (broken by fish predation) and from shallow areas of the House Reef. During the second half of the month we experienced significantly warmer ocean water temperatures, so have postponed the re-transplantation of existing frames until later in the year when the sea temperatures have returned to normal. This way we can reduce the stress on existing colonies and increase the chance of fragment survival by waiting until the waters have cooled again. replace lost number tags and re-transplant missing/dead fragments. 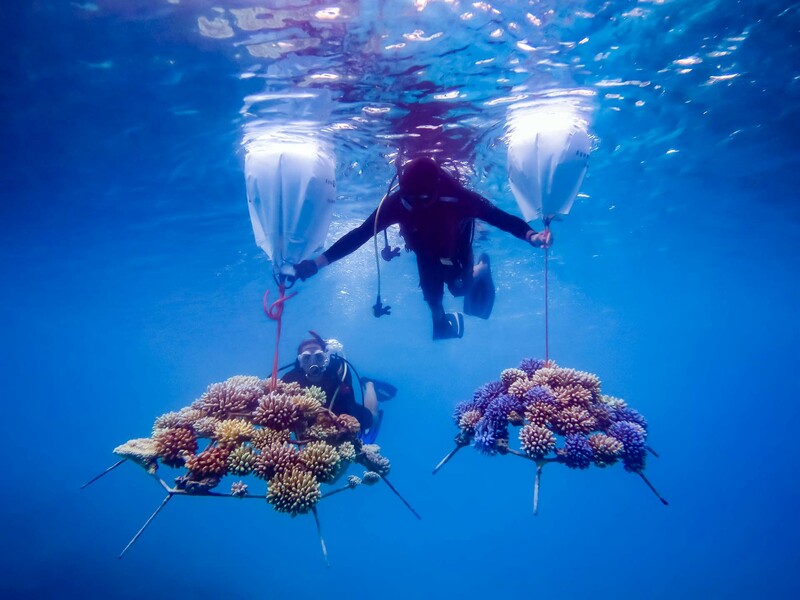 We are continuing to find and remove Crown of Thorns starfish (COTS) from all the sites around the island. A total of 81 individuals have been removed throughout March. We will continue our efforts to remove these voracious coral predators as and when we find them as well as on scheduled COTS removal dives. 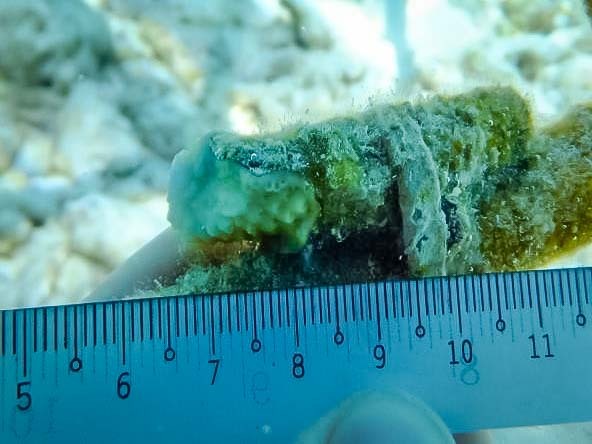 Since 10 March, we have seen the seasonal increase in water temperatures starting to cause coral bleaching in the Channel site, with some frames showing pale-coloured colonies. In order to document the bleaching, we will randomly select a number of frames at different sites around the resort and take monitoring photos to make comparisons over future weeks. 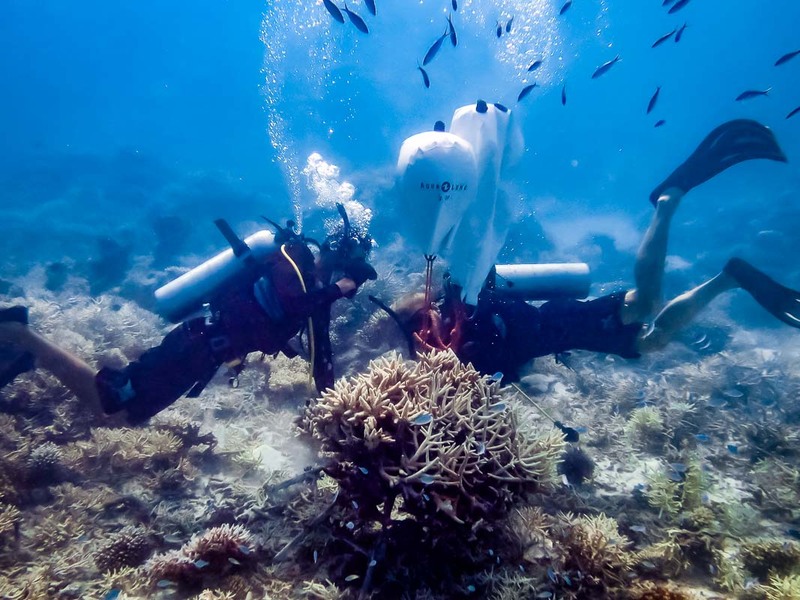 (See Coral Bleaching Updates for more news and photos). We were expecting the mature coral colonies to broadcast spawn shortly after the full moon on 23 March. 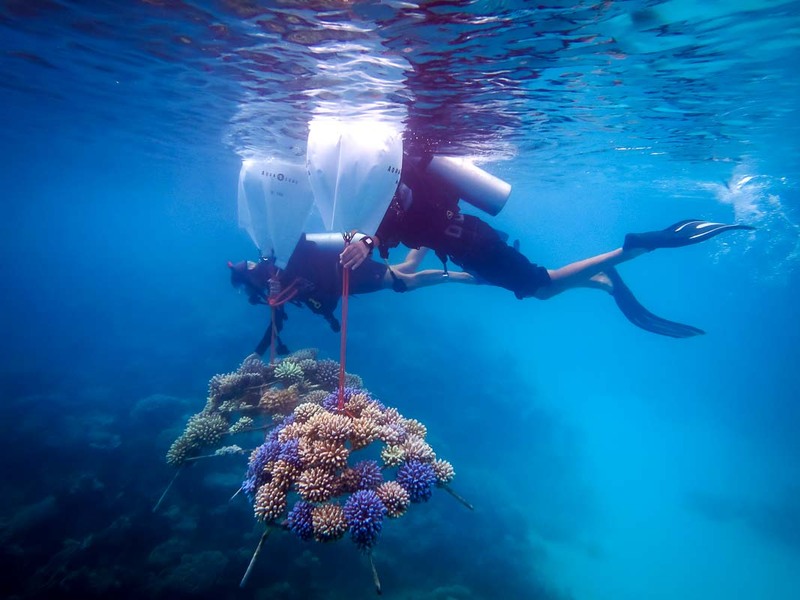 Whilst collecting coral fragments from the House Reef during the weeks leading up to the full moon, colonies were checked for maturing and mature oocytes. 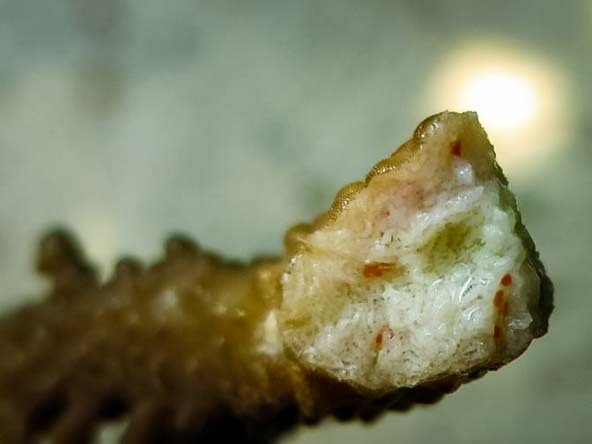 Gravid (‘egg-carrying’) colonies were first observed on 21 March, when fragments were collected for a guest frame activity. Having extended her internship, Emily’s research is ongoing, with a further three months’ worth of valuable data to collect. Fragments continue to be photographed on a weekly basis and ImageJ software is being used to calculate growth measurements. 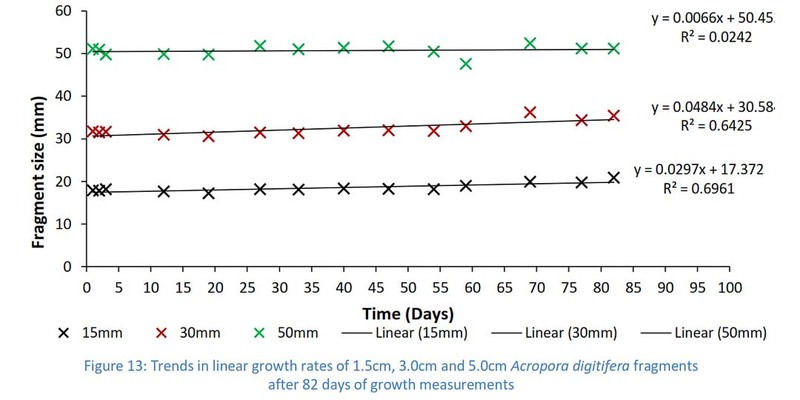 All three fragment sizes have shown growth, with linear regression analysis indicating the 3cm fragments have grown the most rapidly and 5cm fragments the slowest. 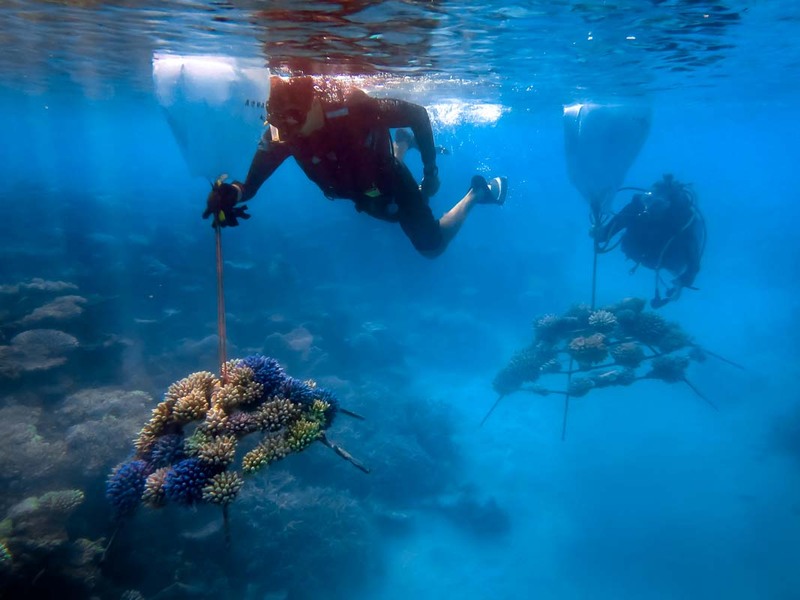 28 new frames were transplanted during March (mainly at the Dive and Coral Beach sites) and we now have 2,878 coral frames around the island, covering an area of approximately 5,780 m2. 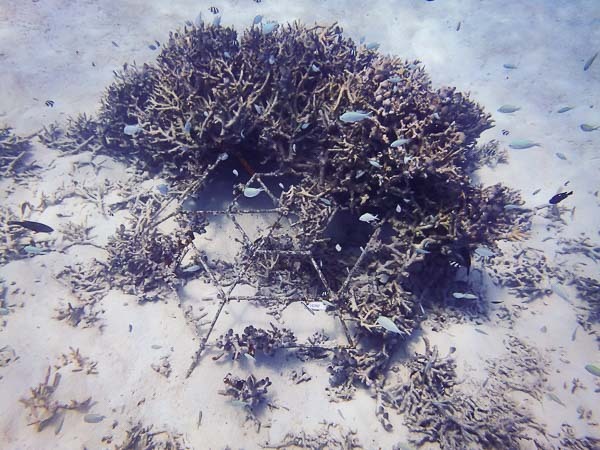 We also monitored (maintained and photographed) a total of 553 coral frames during March, mainly in the Landaa Estate and Coral Trail sites. 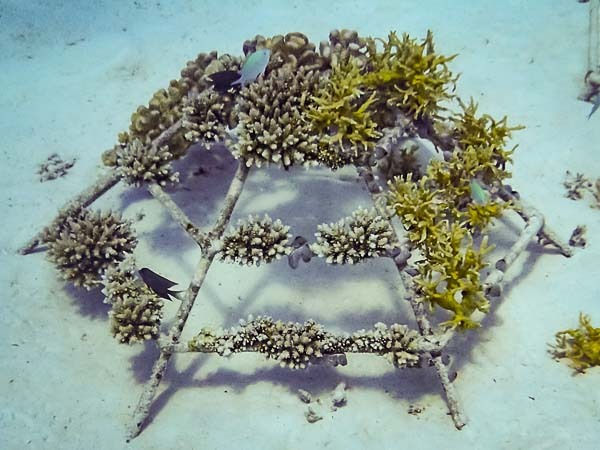 We are experimenting with siting some frames under the dive jetty (shaded, 4m deep) as a trial to protect against the upcoming seasonally warm waters and potential bleaching event. Other frames have been located in 3m deep waters. 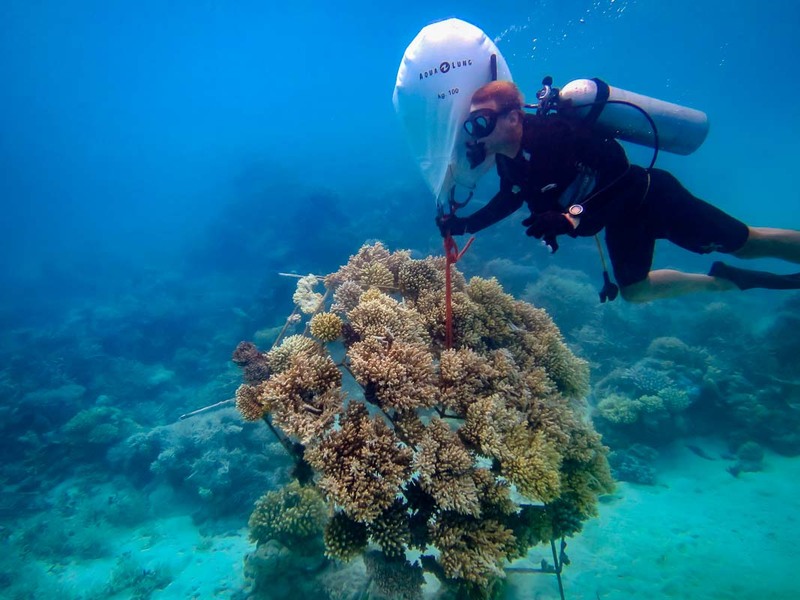 (See Coral Bleaching Updates for more news and photos). 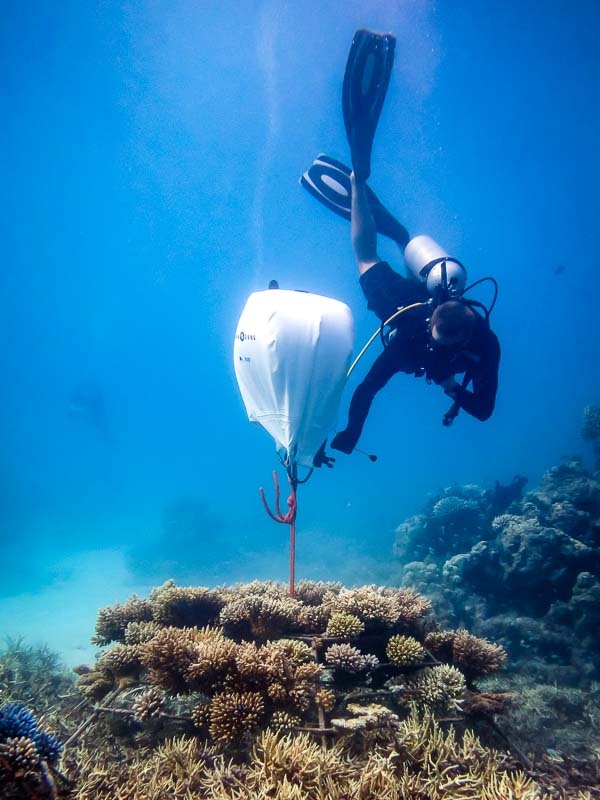 Corals in shallower waters have started to become paler than the deeper corals (e.g. LG1951, LG1673, LG1648) and at the House Reef and Lagoon sites we have started to see the first signs of bleaching (along with the presence of green filamentous algae). 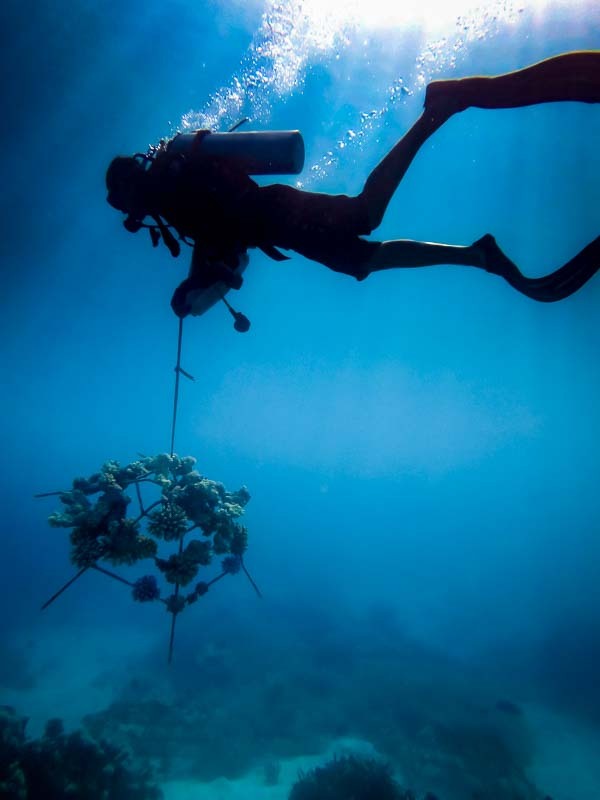 We will not be creating any new frames during April, and re-transplantation of coral fragments is postponed until June, when the seasonally high ocean temperatures will have returned to normal again. All our efforts will be concentrated on monitoring for bleaching, relocating ‘at risk’ frames and some new experimentation. Sand accretion is affecting deeper frames (eg: LG0342, LG2094, shown below) in the ‘Coral Trail’ site (on the exposed side of the island). To rectify this, we have been relocating affected frames to more stable rubble areas using air-lift bags.